There is drama and there is high drama. Aruncus dioicus or giant goat’s beard is high drama, looming up to 180 cm, bearing creamy-white plumes that rise above the dark foliage and brightening up the shady garden. Susan Lipchak, one of the master gardeners featured in Gardening from a Hammock, suggested both the giant Aruncus diocus and the smaller Aruncus dioicus ‘Kneiffi’, cutleaf goat’s beard, for the shade. 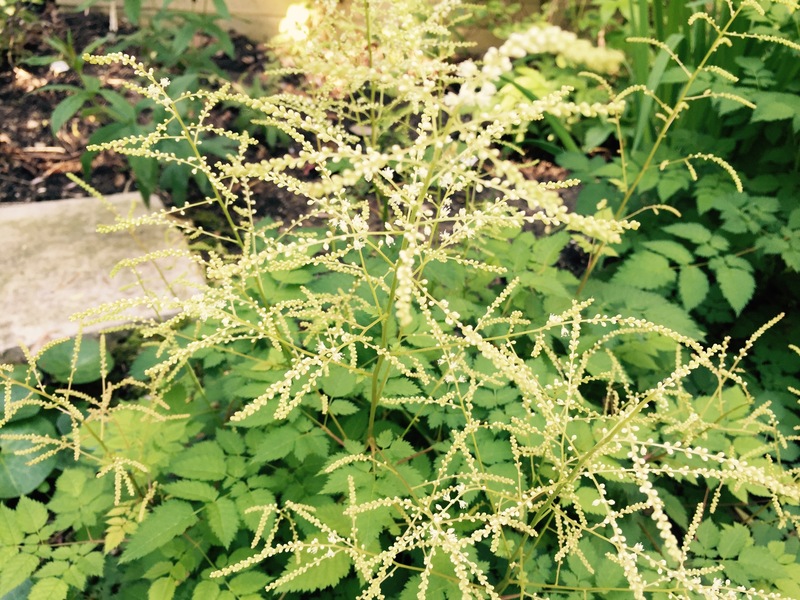 “The Aruncus dioicus is a dramatically bold plant because of its size – it looks like a giant astilbe,” says Susan. It holds its own beside a giant clump of tall grasses in her garden. 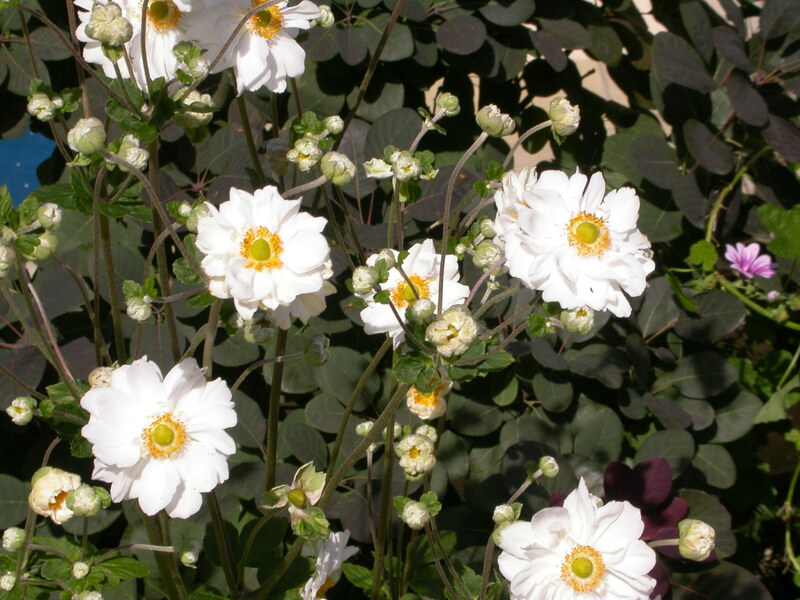 This perennial stands between 120 to 180 cm and is spectacular in flower with its creamy white plumes and lacy leaves. It eventually forms a dense clump. The ‘Kneiffii’ variety is smaller, but still stands 90 cm and has finely cut leaves, which would suit a smaller garden. This hardy perennial complements summer-blooming shrub roses, brunnera, ferns and hostas. Photo courtesy of Heritage Perennials. The giant goat’s beard is ideal for the back of a shady border or beside a pond. It needs room, as it will spread between 90 and 150 cm. Expect a strong statement from the creamy-white flowers June through July. Where the giant goat’s beard would be too large, the more compact cutleaf goat’s beard (Aruncus dioicus ‘Kneiffii’) would provide the impact without the height. It is smaller at 75 to 90 cm high, but with the same spread. It has finely cut leaves similar to a Japanese maple with creamy-white flowers June through July. As an interesting aside, the male flowers produce showier and more erect plumes (I am not making this up) than do the plants with female flowers. To get new plants, divide clumps in spring or fall, but be aware they do not like being moved. 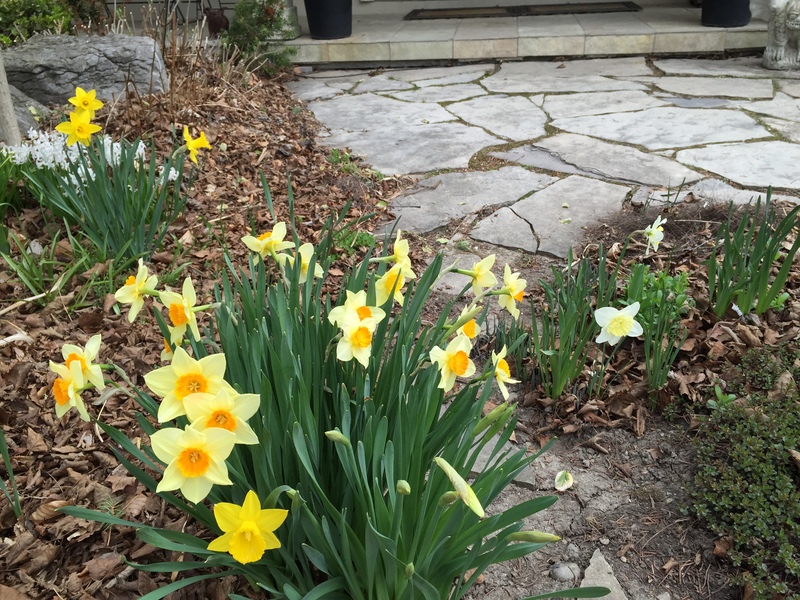 This was originally published as part of Canadian Gardening series of Low-Maintenance Mondays. 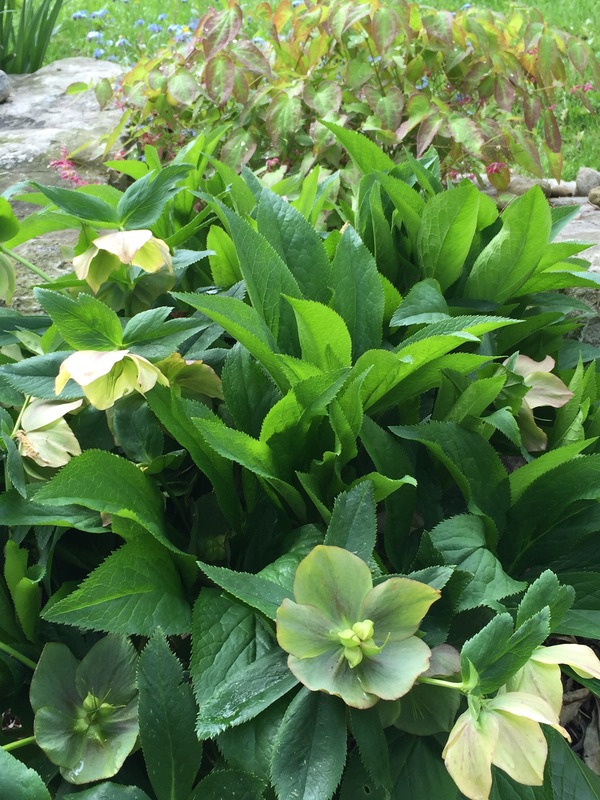 One of the first perennials to show off their colours, the Hellebore (Lenten Rose) also provides us with glossy leaves throughout the year. 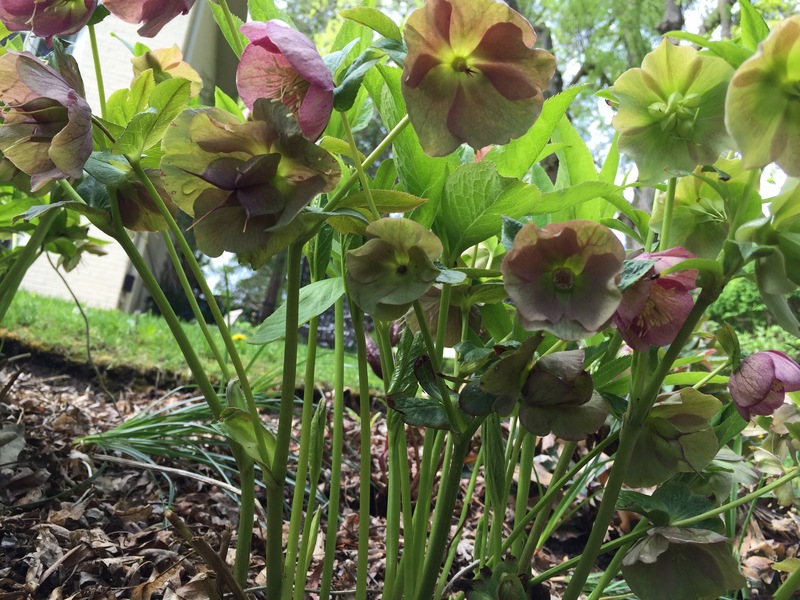 At a March workshop with garden guru Marion Jarvie, she suggested we cut off the old dead leaves of theHellebore now, even with some snow on the ground, to ensure we get the best view of the flowers when they arrive. And that will be all we have to do all season to take care of this hardy plant. 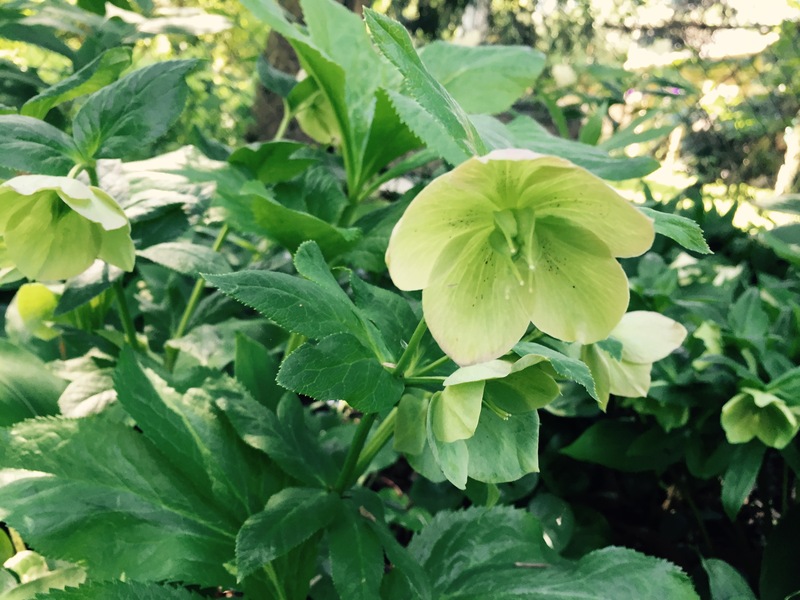 It’s important to remember that the flowers of the Hellebore face downward so ideally we plant them to accommodate that. 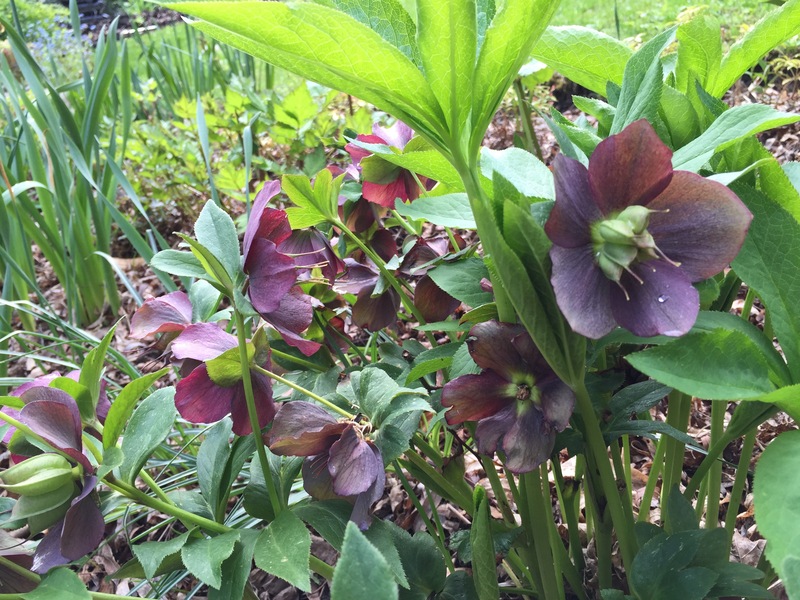 Some of the newer varieties however, such as Hellebore ‘Anna’s Red’, a variety where red flowers look up instead of typically downward. 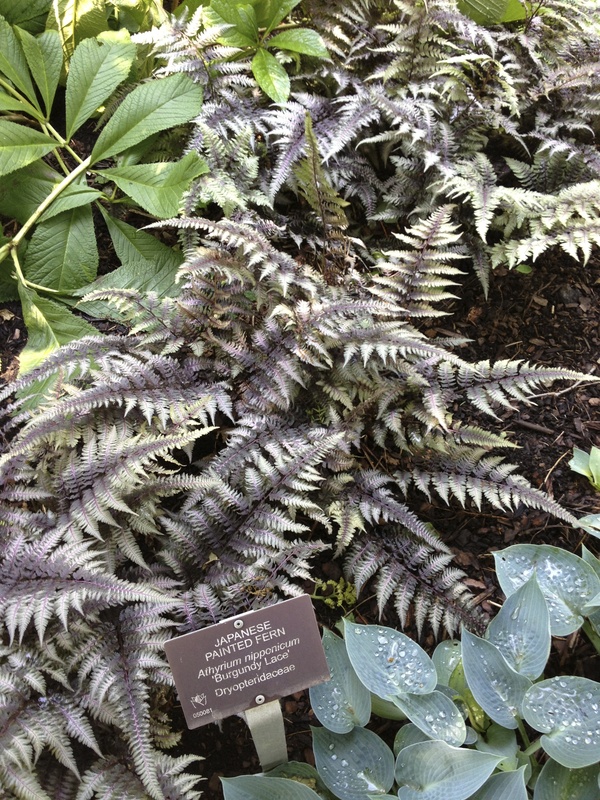 As well, the plant has mottled foliage to contrast with the dark green of the other varieties. Here are some photos from my garden in zone 5 Ontario. I recently went to a workshop at the Toronto Botanical Garden only to hear dozens of questions about what to plant in the shade. We thought we would provide some answers. The experts featured in Gardening from a Hammock shared their favourite easy-care perennials with us. Although we edited the book to ensure there were no repetitions, in the early interviews there were many repeat favourites. We share them here in anticipation of a new planting season. 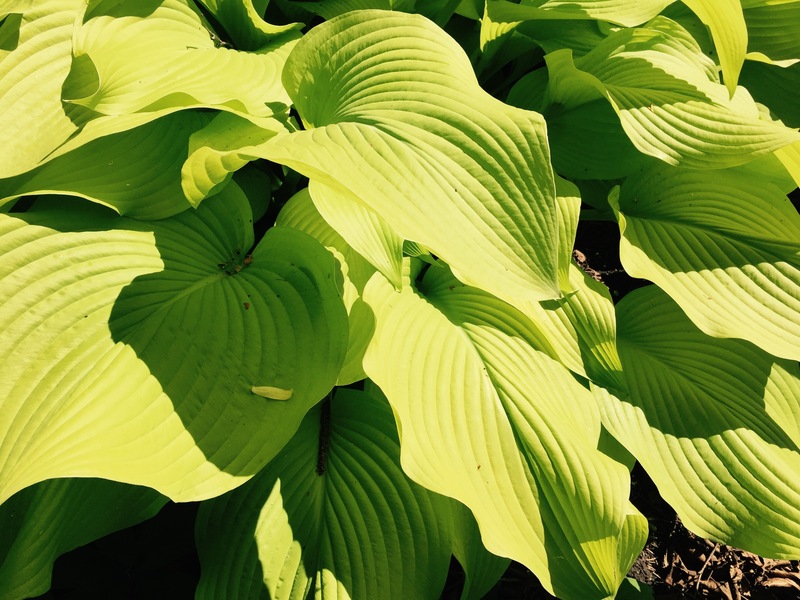 Although we are fans of hostas, we are not including any in this blog, because we know they are so obvious; they work well in the dark shade, dappled shade, and part shade and come in countless sizes and variations. All the favourites we feature today were frequently mentioned. 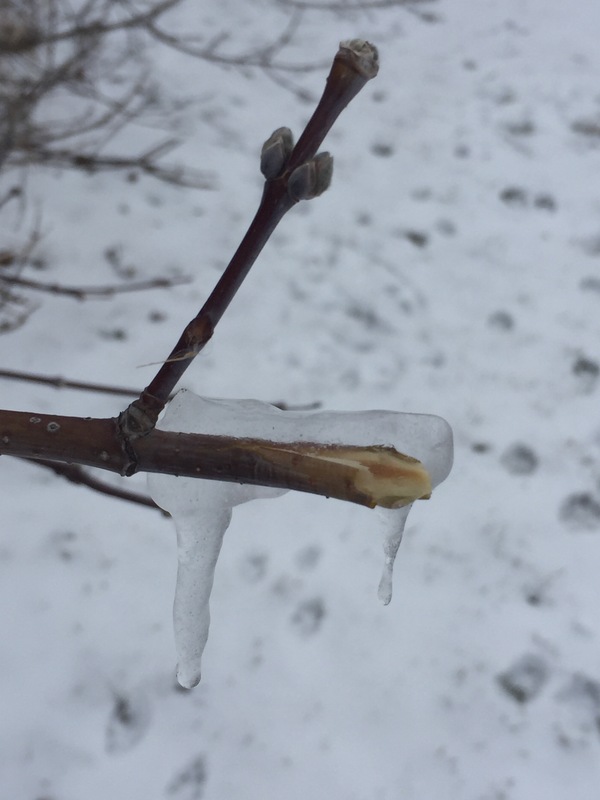 Looking at the snow covered ground, it was a treat to think about plants and suggest some low-maintenance plants for the interesting smiling gardener website. But what a hard task: to choose favourites from the 300 star plants in Gardening from a Hammock. Tight on space, the website article includes only the Japanese Painted Fern (Athyrium niponicum) and Blazing Star (Liatris spicata) we recommended. 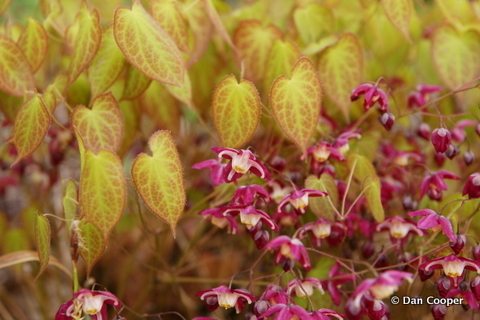 Epimedium is an underused low-maintenance plant that is a workhorse the spreads slowly to form a groundcover in hard to plant dry shade or sun. Called Barrenwort or Bishop’s Hat (from the shape of the flower), this drought-tolerant plant has heart-shaped, red/green leaves with small flowers in a variety of colours: red (Epimedium x ‘rubrum’) yellow (Epimedium × versicolor ‘Sulphureum’) or white (Epimedium x youngianum ‘Niveum’). These elegant but tough plants will grow under just about anything, include Maple Trees. Leaves are semi-evergreen depending on your zone. They’re drought tolerant, have delicate flowers in a variety of colours, and lovely heart-shaped leaves that turn red, purple or bronze in the fall depending on the cultivar. I love Hostas because they are so accommodating, interesting and they share. There is a size and colour to fit in the smallest and the largest gardens. And they are tough. Nothing thrived under our water-sucking Corkscrew Willow – not even hardy Vinca or Creeping Jenny – until we planted Hostas. As you can see from the photo, there are many different varieties, sizes and shapes that get along with not just one another, but with the dominating Willow. Many of these started as pieces of other Hostas thriving throughout the rest of garden. Yet tough as they are, the succumb to the tiny slug and at this time of year, many Hostas resemble Swiss cheese more than plants. Our book, Gardening from a Hammock, guides you to specific varieties that don’t seem to be eaten despite their proximity to slugs. Our gardeners suggest we look for Hostas that have waxy leaves, thick leaves, corrugated leaves which make snacking more difficult for slugs. Notice how the large Hosta in the background, Sum and Substance, glows in the shade bed. This closer view of the Sum and Substance Hosta illustrates how its thick textured leaves protects it against slugs. I spent years planting tulips while the squirrels perched in the trees above, watched and waited for the right moment to feast on their favourite bulbs. If they missed a tulip, they would eat it early spring. I tried digging the bulbs deeper than suggested. I used bone meal. I put human hair cuttings over the soil. And still the squirrels outsmarted me. As a lazy gardener, I also tried species tulips which have much smaller bulbs and spread on their own. Still no luck. 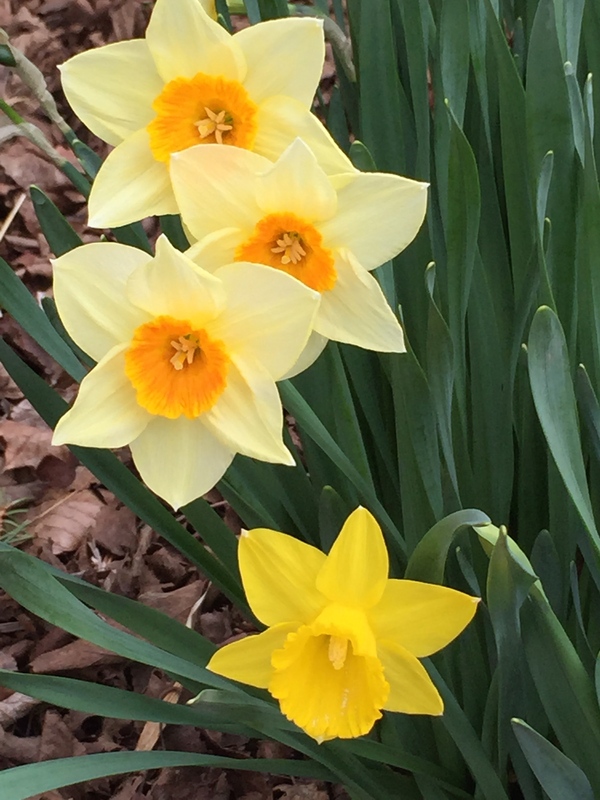 So the past few years I have planted daffodils and narcissus. The squirrels don’t like them. Each year I add a few different varieties, and admire the assortment of sizes, colours and flower shapes. I am now a big fan of the daffodil. They are such happy plants and bring a smile to my face. And the squirrels now concentrate on getting into the birdfeeders. 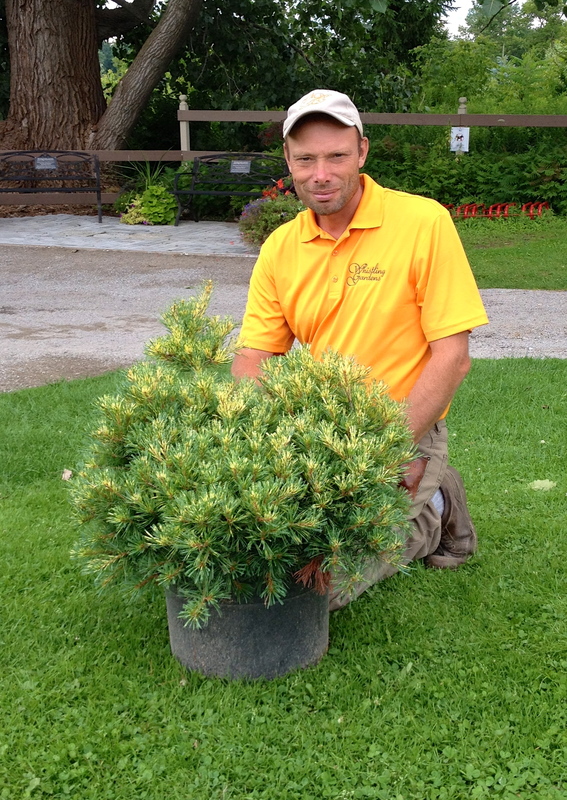 Darren Heimbecker, owner of Whistling Gardens which boasts 20 acres with 2,500 different conifers, singles out one of his favourite low-maintenance shrubs. Pinus Parviflora ‘Ogon Janome’ (Japanese White Pine or Golden Dragon eye white pine) is a slow-growing yellow-variegated conifer that handles a fair amount of shade. 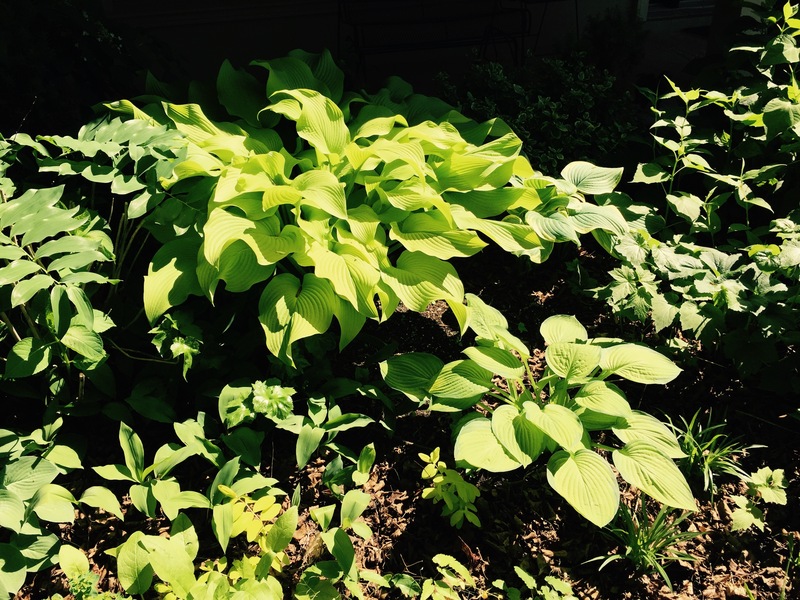 “You never have to touch this plant,” says Heimbecker, “just enjoy it.” He explains that it takes backstage for the summer, but is front and centre in winter with its layered colours of variegated gold, green, silver, grey and blue. It has a globe shape when young and can become broadly conical with age. Heimbecker says that after 10 years his Japanese White Pine is only about two feet. Whistling Gardens (www.whistling gardens.ca), south of Burlington, Ontario, has one of the largest conifer collections in North America featuring many rare varieties of ornamental and native trees and bushes. Here is another hardy, reliable plant that carries us from late summer, early fall all the way into the winter. Check out Anemone x hybrida ‘Honorine Jobert’. Japanese anemone. These tall, elegant white daisy-like flowers dance from August through October. They work as cut flowers, as an accent and provide vertical interest. 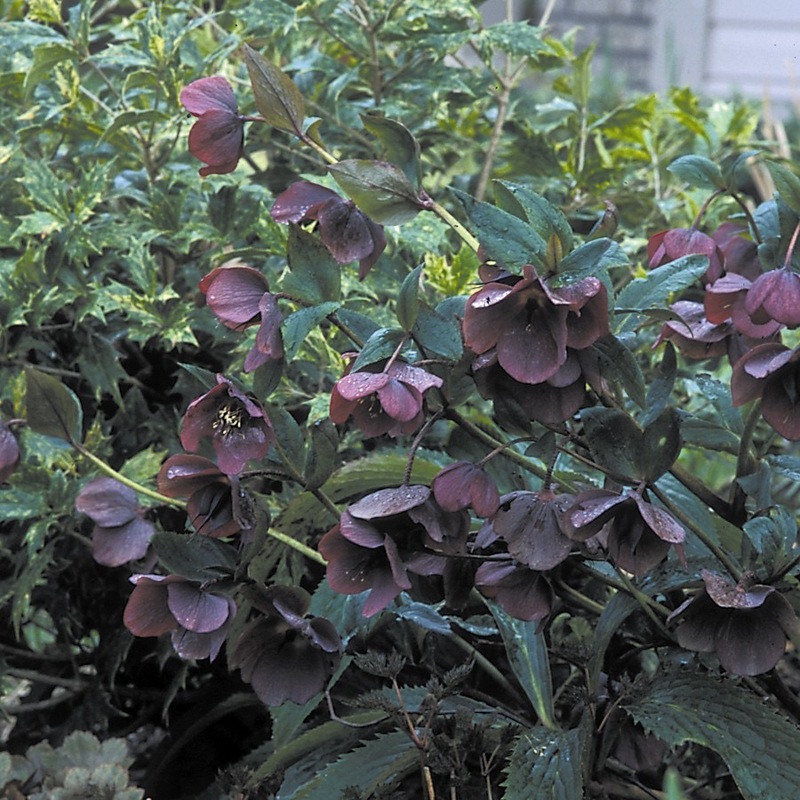 How about some plants that strut their stuff in the fall. Check out the epimedium rubrum.